Deco Holiday has become one of our best selling Christmas patterns. 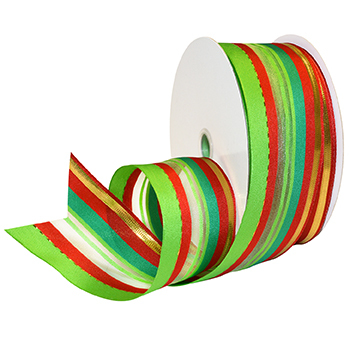 Woven with a beautiful and graceful wired edge, this ribbon has all the seasons best colors. Perfect shades of red, two greens and bands of glistening gold make Deco Holiday great for decorating wreaths, trees, packages and more! Material is a woven mix if satin, sheer and metallic.